A spicy and fun tea that is perfect to welcome in the warm weather. 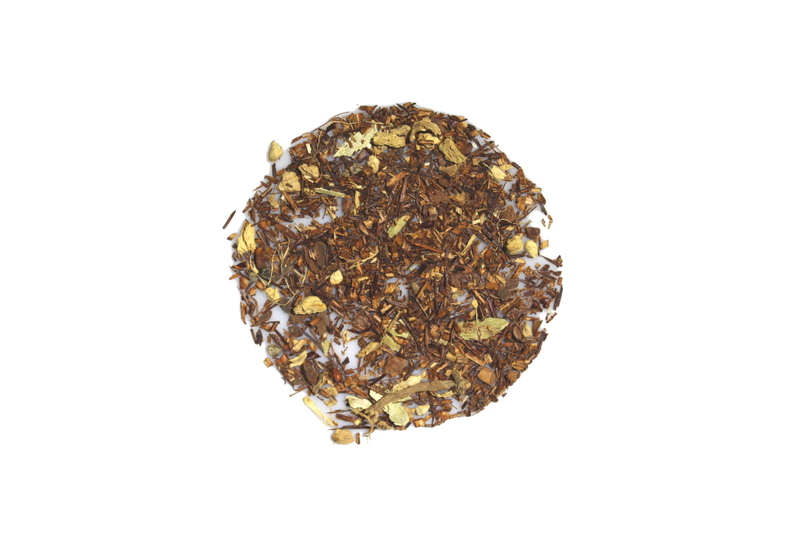 The earthy flavors of the rooibos and ginger root combine with the sweet cinnamon and mango bits for a tropical drink in your favorite tea cup. It is also a great late night drink with its very low caffeine content. I just got this in my monthly box and it was very tasty! I would have loved it more if it hadn't reminded me of medicine! It smells good, but just like some throat and cold medicine I've had before. I'm sure anyone who hasn't had medicine like that would like this, though. I liked the low caffeine - that's what I prefer. First tea from my first box, and it's so good! It was very good warm (can't wait to try it iced) and had excellent flavor. This was by far my favorite tea sample in my October box.